When I first got into gardening I was attacted to large blooming perennials, and planted mostly those. I have come a long way since then, namely I appreciate things like edibles more, interesting foliage, and length of bloom time as much as bloom shape, size, or color. But sometimes that interest in large blooming perennials rears up. 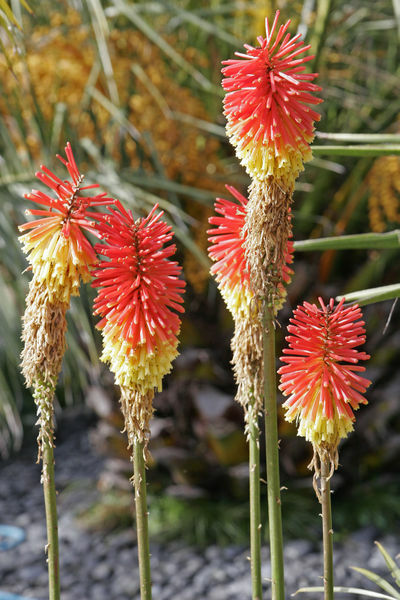 Enter Kniphofia, other wise known as Red Hot Poker plant. A few years ago on a walk I saw it in bloom, thought it looked cool, and wondered why I had never seen it before. I couldn’t find a good source for plants, so I bought some seeds and started them. Unlike many of my seed starting endeavors this worked out, and I transplanted them outside, and generally took care of them. Three years later they got big and bushy and were ready to bloom. For a perennial from seed that sort of length is typical. I was pretty excited as I watched the scapes rise. In the end this plant only bloomed for about three days, and it never got “red hot” remaining more a muted salmon color at best. What is more it had the bloom habit of a gladiolus where the lower flowers bloom and close before the uppers open, so the whole “poker” was never in bloom at once. It bloomed for such a little amount of time, that I didn’t get a chance to take a picture of it, so below you see it not in bloom. Now, if I’m going to give roughly 4 or 5 square feet to a plant in my garden it better bloom for more than 3 days, or provide me something edible. A few days after it had stopped blooming, I dug it up… oops. A rabbit had taken advantage of the messy foliage mound and dug a burrow directly underneath it, which I had now destroyed. 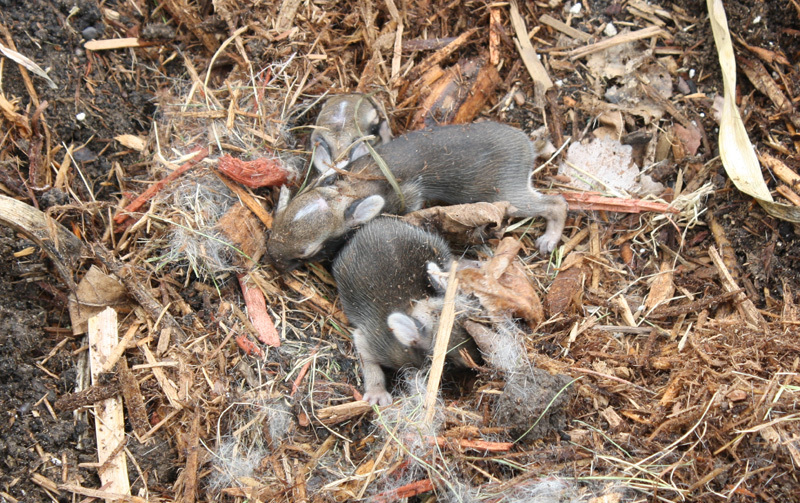 Luckily my shovel did not crush any of the 4 eyes-still-closed baby bunnies inside of it. I reconstructed a fake burrow by cutting a black plastic nursery pot in half and then covering it with mulch. I placed the babies back inside and on advice put down markers so I could tell if the mother returned. After two days the mother had not returned so I took the babies to a local wildlife rescue place where they could be nursed. Apparently they were really closed to being weaned naturally, despite still having their eyes closed, so they had a good chance at survival I was told. This just shows you never know what you’ll find when digging in your garden, though next time I’d rather it be gold coins. In the place of the horrible Red Hot Poker plant I ordered something truly hot, a double echinacea called ‘Hot Papaya’. Coneflowers have a long bloom period, which I like, but I dislike the big brown center on the standard coneflower. The double varietes are like much more attractive to me and I grow one of the original pink cultivars already. 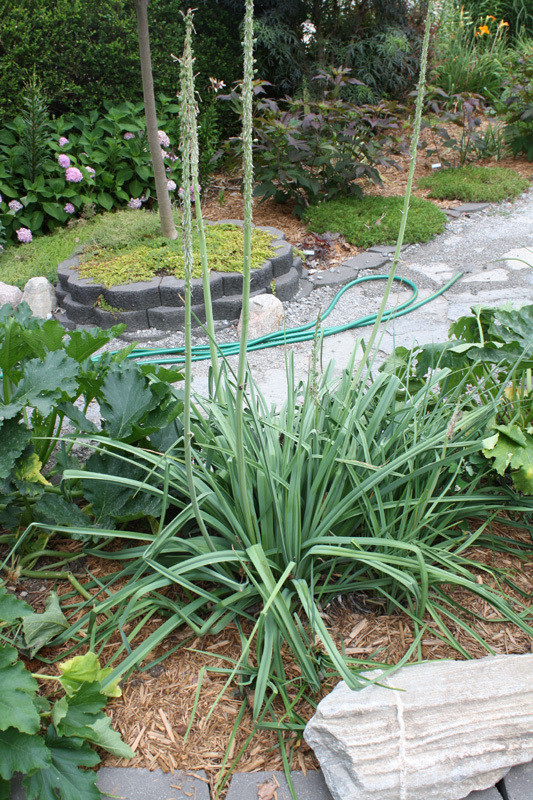 I noticed my neighbor had one of these the other day, and it was doing well, and it seems like it would be the perfect plant for the spot where the kniphofia was. I had originally wanted a nicely blooming bright red perennial for that spot after all. This is an exciting story. Finding those bunnies is truly unique and special that you were able to help them. Your right, gold coins would be nice too. Thank you for sharing, great pictures. I found some people also called Red Hot Poker as the Torch Lily. I do plant some in my garden and they spike 2-5″ high now with most of them are of ivory white. They simply gorgeous and seems to be a favorite of hummingbirds. That’s a beautiful plant! Wow, do you know where I can get seeds? Online even? I have Red Hot Pokers in my garden. They are a blessing because they are so hardy and can handle the temperatures of Northern nevada. I have found that not watering directly over the plant helps to keep them green in winter. Those bunnies are so cute!!! I moved in to a property that is a gardening paradise, and VERY heavy on the lilies (probably over 100 lilies of varying species). I have to say, the Torch Lily is one of my favorites. The unique shape makes it a real conversation piece. No wonder the previous homeowner put it front and center! I would take a bunny burrow as a consolation prize, though. I planted a red hot poker in a large decorative pot on the side of our front porch. Beautiful plant. Have had a lot of blooms through the summer. Anxious to transplant and split this fall! Pokers need Heat and full sun to bloom well. in the pic you have them planted with Acanthus, which loves cooler spots, and shade. Not to be planted together, no wonder poker only bloomed for 3 days. Move to sunnier spot!! Last year I helped my daughter plant red hot pokers in the flower beds to the front of her home, western exposure. The front of her house gets so hot you can hardly touch the front door in summer. Needless to say, the red hot pokers flourished to the point where they almost took over the beds. We are digging them up this year and transplanting them to my home (I really love the plant but they can get huge and overpowering)where they will follow the fence line to my backyard. Great plant! I think I just killed my red hot poker plants. I cut them down to 3 inches. Will they survive? I remember our neighbor planted torch lilies in the narrow garden between our property and theirs. I loved to watch the hummingbirds as they feasted on the plants. I have put out a hummingbird feeder for years but am trying to create a garden that will feed them naturally, since there has to be nutrients in the plant that sugar water doesn’t supply (I do use raw sugar instead of white, processed sugar). I bought a small torch lily plant last year and it now has three ‘pokers’ and a fourth just sprouting. I planted them in a large pot on the edge of my patio where they would good sun exposure but would not take over my yard as the plant produced new growth. I love them and so do the hummingbirds. I love this plant! Mine bloom for a very long time. I have two varieties, the early variety has wider leaves and started blooming last week. They didn’t bloom the first year. the second variety blooms late summer and has very narrow leaves. I like the color, the unusual shape and I love the texture of the spiky leaves, not unlike a pineapple. It adds a nice variety to the more rounded leaves of the other plants in my garden. I mulch them in the winter as the Central New York winters can be pretty harsh. I grew this in my MI garden, and it was absolutely incredibly successful. And no bunny nests. I planted from root/rhizome though, not seed. It is possible yours just needed a couple more years to become the incredible plant it can become. Not sure where you garden. Mine bloomed from early July into November every year as long as I cut the spent flower stalks back. Otherwise, you are giving the plant the message to no longer grow because it has completed its life cycle for the growing season. Keep the spent flower stalks cut back, and the plant will put up new flower stalks. And the hummingbirds in my yard flocked to this plant! The red hot poker is by far my favorite. We are in PA and they are extremely cold hardy, no covering in winter. I love the tropical look they give. Mine bloom all summer into early fall if warm enough and they bloom non stop, we always have beautiful flowers and they’re so bright, they’re also virtually care free once rooted. By far the most beautiful and long lasting flower in my garden. Split well too, I got 4 huge ones and started with one. Enjoy! If you deadhead Red Hot Pokers, they will continue to bloom throughout the entire summer. My husband planted 6 Red Hot Poker plants that were given to us. The first year no flowers but figured that was the shock of being transplanted. This year we have flowers on each plant and have just deadheaded one and hoping they continue to bloom. My husband passed away Dec. 13, 2014 so he is not here to see his flowers but know he is looking down from Heaven on them. I have a 12 by 12 bed clumps of red hot pokers . I’ve seen pictures of multiple blooms in a bed my size. I am only getting sparatic blooms . The bed has been established for 10 years or more. They get late morning and afternoon sun. I live in augusta ga. Why am I not getting large quantities of blooms? I love the Red Hot Poker flowers. Mine are in full sun all day untill the sun goes down. They always bloom. I didnt know you had to pinch off the spent blooms. I will from now on. Thanks for the tips. also. Plant them folks and maintain them. My own opinion. I’ve been told that if you cut the stalks after the flowers are finished, it will grow new ones. I haven’t tried this yet. In the back which NEVER got sun. Didn’t have to did use as often but bloomed like crazy. And the cone was even more bright than the ones in the sun. When my sister got married, she wasn’t one to dig in the dirt, but she liked those flowers. She used big pots on the front porch. Never divided them, and the 4th year the roots broke 2 of the pots. I know have some at my house. In front, NO sun, in back 4-6 hrs a day, and bloom from about the first of May, till freeze each year. I thought they were like he mother in laws tongue,….couldn’t kill them. Planted 2 torch lilies about 5 years ago. Didn’t do well in the location, so I moved them 3 years ago. Flowered once in the new, sunnier location, and then basically seemed to die off. HOWEVER, in their exact places now thrive and bloom two deep purple Tradescantia… ??? I swear there were none planted near the first location, although I do have them in other beds around the yard. It is just so strange. I checked the morphology, and the two aren’t related – Spiderwort native to the Americas, while Kniphofia are native to Africa. Conclude that seeds must have been either in the transplanted clump or the new bed soil. Wish I’d taken photos of the evolution! While pulling out of my driveway today, I was looking at the front yard and couldn’t believe what I saw but a red hot poker plant in full bloom growing in the middle of my day lilly. I’ve always wanted one but have never seen them for sale in my area. My neighbor across the street has several growing in his yard. Well I can only assume that a bird brought it over to my yard. I think I can guess how! So now I’ll have to wait till the end of summer to see if I can dig it out and transplant it. They continue to meet expectations. I would think the blooms are being chewed off by the rabbits. If an edible is what is preferred, keep the Red Hot Pokers and enjoy some rabbit stew. My husband confused my red hot poker grass with chives and put some in his sour cream at a chili contest. He won!! Now I see that it is toxic, Everyone had a few pieces on their crema in their chili. Hope it is not too toxic.Don’t know what it does. It just says toxic. 1) They may be overcrowded. Divide the rhizomes and space them out a bit. After dividing, they may not bloom for a year or two – although mine have not had that problem (large divisions). 2)The soil may be depleted. You can top dress with compost each year to partly renew the soil. Or you can dig them up in early spring or late fall and replace the soil. The plants love rich and moist (but not wet) well drained soil – in full sun.